It’s been nearly six years since SMI launched the Dynamic Asset Allocation strategy (DAA). It’s understandable why some investors have been disappointed with its recent performance relative to the U.S. stock market. Now that we have several years of real-time experience with the strategy, we thought it would be helpful to revisit the original rationale for DAA, examine its recent performance, and — most importantly — assess what role DAA should have in SMI investor portfolios going forward. When SMI’s Dynamic Asset Allocation strategy (DAA) debuted in January 2013, it may not have seemed particularly revolutionary. But it approached two core investing issues from a totally different perspective than SMI had used up to that point. First, it was the first major departure from our long-held stance that risk could be effectively managed by adjusting a person’s stock/bond portfolio allocations. Second, it upended the idea that investors are best served by setting a fixed portfolio allocation and holding it through bull and bear markets alike. In fact, DAA had the potential to shift investors completely out of stocks at times. By 2012, the handwriting was on the wall regarding the ability of bonds to provide long-term portfolio protection. Radical new policies by the Federal Reserve and other global central banks had shrunk the majority of global government bonds to negative yields, and U.S. interest rates were also hovering at historic lows, barely above zero in the case of most shorter-term government debt. Given the fixed mathematical relationship between bond yields and prices — prices have to fall as yields rise — there was virtually no long-term upside left in bonds, but there was plenty of room for bond values to decline if/when yields reversed and moved higher, back toward their historic norms. For 30 years, declining yields had helped bonds provide the safety net investors relied on within traditional stock/bond portfolios. But with that safety net looking tattered, we needed a new approach. The search for an alternative to bonds as a means of protecting our portfolios drove the research that led to DAA. Incidentally, our outlook regarding bonds hasn’t improved since DAA debuted. The past two years have seen bond yields slowly begin to rise, and as expected, bond returns have been poor. But the bigger issue — and likely to become the dominant financial issue of the next decade — is the absolute explosion in global debt over the past decade. With interest rates hovering near zero for so long, debt has cost borrowers very little to service. Not surprisingly, heavy borrowing has ensued. The ramifications of this debt explosion are beyond the scope of this article, but it’s hard to imagine how businesses (and governments) will be able to keep making their payments as interest rates rise, especially if economic conditions worsen, as they inevitably will at some point. Suffice it to say, SMI is even less enthusiastic about large bond allocations today than we were six years ago when DAA debuted. SMI has always approached investing using a trend-following, rather than predictive, approach. When we embarked on the research that led to DAA, we wanted a system that would help our portfolios hold up under a broad range of economic conditions: inflation, deflation, recession, expansion, and so forth. Expanding on Harry Browne’s “Permanent Portfolio” idea from the 1970s, we identified six asset classes that collectively cover the range of economic conditions we were most concerned about. However, rather than settling for a buy-and-hold approach (as the Permanent Portfolio does with its four asset classes), we added a timing mechanism that would allow us to own only the specific asset classes best suited to the particular economic conditions currently present. Another way to think of this is we found a way to “Upgrade” among asset classes. 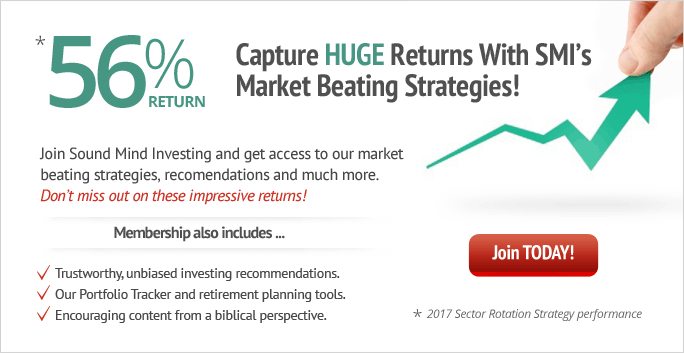 Our research indicated this would make a huge difference in the risk and returns in the portfolio — mostly due to not owning certain assets at certain times. This was the genesis of DAA’s “winning by not losing” tagline. The specifics of the original research and “nuts and bolts” of how to implement DAA are detailed in the January 2013 cover article, DAA: An Investing Strategy for the Risk-Averse. We recommend reviewing that article if you’re unfamiliar with DAA or are interested in more of the theory behind it. Summarizing the research, DAA’s backtesting showed a strategy that had outperformed the stock market over the prior 30 years (1982-2012), while also being 42% less volatile than stocks! That is an incredible combination. But while we knew the psychological side of implementing DAA would be challenging, the extent of that challenge would only be revealed later. With the benefit of hindsight, there are a few things we wish we had done differently in the initial presentation of DAA. It’s not that the original article was inaccurate — we did, in fact, try to caution readers that this was going to be an emotionally difficult strategy to implement, specifically drawing attention to the type of extended, late-bull market we’ve experienced since DAA launched. Despite these admonitions, SMI readers can be excused for coming away from the original article with the following idea: DAA beats the stock market and doesn’t lose money. Unfortunately, the truth is more complicated than that. The first two years out of the gate, DAA turned in gains of +16.2% and +13.0% which, while trailing the S&P 500 index, had DAA investors feeling pretty good. But it didn’t take long for DAA to do something in live practice that it had never done in the decades of back-tested research: produce back-to-back negative annual returns (2015/2016). In hindsight, our initial presentation should have focused more attention on rolling periods (all 12-month periods, not just those that begin in January) rather than calendar-year returns. The table presented in the 2013 article (and at right) showed only the one small annual loss in 1990. Using rolling periods, DAA has lost as much as -13.7% in its worst 12-month period. Shorter time periods have occasionally been even more volatile. DAA would have lost -14.8% between February-October 2008, despite rallying to finish 2008 with a slight gain (and the most impressive year relative to the stock market in its history). In hindsight, the other thing we would have handled differently is to focus even more attention on how challenging it can be to follow a defensive strategy like DAA when the stock market is soaring higher. We did note the example of 1995-1999 in the article, the last period resembling today’s market. We were trying to help readers understand how emotionally difficult DAA could be in that environment. To some degree, there’s an emotional/behavioral aspect of this that suggests words can only impart so much — that it takes actually experiencing a period like we’ve been through in recent years to truly understand its impact. If we could do it over, we’d have presented an analysis of exactly how DAA wins over the long-term to try to illustrate more clearly how different DAA is than the other strategies in an SMI portfolio. We turn to that analysis now. As the above quote implies (from Brian Portnoy, author of The Crucial Role of Behavior in Making Investing Decisions), the idea of diversification sounds great, but its actual practice is distinctly less fun. If you’re truly diversified, at any given point in time something in your portfolio will be doing well while something else is doing poorly. If everything in your portfolio is doing well simultaneously, you’re probably not as diversified as you think! We tend to understand and accept this in the context of the traditional stock-bond relationship. That’s because many of us have experience with traditional stock/bond portfolios, plus we have modest expectations of bonds to begin with. But when our expectation for DAA is that it will beat the stock market over time, it’s easy for hope to turn to loathing when the strategy significantly lags stock returns for a few years. The fact that the current bull market recently became the longest in history isn’t helping DAA. This late-bull period of relative underperformance has gone on and on, just as it did in the late-1990s. Intellectually we may understand that DAA can’t be expected to keep up with stocks in this environment, given that it never invests more than one-third of its portfolio in U.S. stocks. But it’s still easy to feel disappointed with DAA when the other parts of our portfolio are soaring and it’s the sore-thumb laggard of the group. Thankfully, we’ve seen this movie before. That late-1990s period in the research shows that DAA isn’t broken today. While this type of lagging relative performance happens occasionally, history shows that what follows these periods has more than made up for the temporary discomfort we may be experiencing with DAA today. In fact, the type of market/DAA disparity we’re seeing now can even be a sign that its presence in our portfolios is more needed now than at any other time. 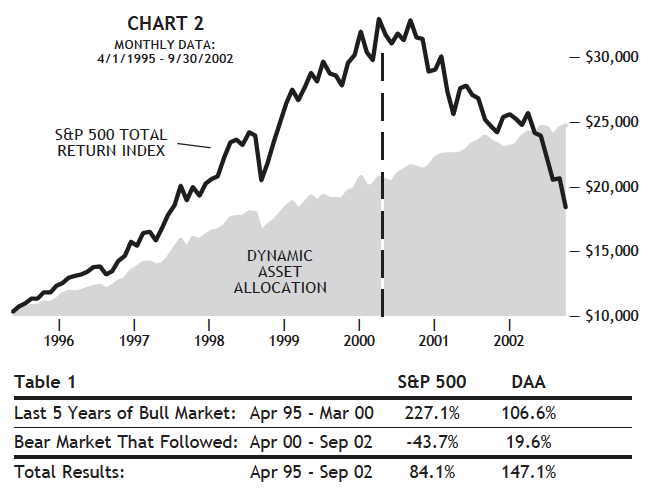 As Chart 2 (below) shows, during the last five years of the 1990s bull market, the S&P 500 index vastly outperformed DAA. Just like today, it would have taken a great deal of discipline to stick with DAA from early 1995 through early 2000 when other strategies were posting much higher returns. Eventually though, the market cycle turned, as it always does. There was no big event that caused the bull to turn into a bear. But in March 2000 the stock market peaked and embarked on a two-and-a-half year decline. Diversification would have meant DAA “saying it was sorry” throughout the late 1990s, but suddenly the situation reversed. By the time the bear market was over, the huge relative performance lead accumulated by stocks was gone and DAA was way ahead. When the entire cycle — up and down — was accounted for, DAA posted a “tortoise and the hare” type finish, cruising to victory by a wide margin. The two charts that follow below take this idea and apply it to today’s situation. Each chart shows the relative performance of the stock market (S&P 500) and DAA over the past five years. This is the area to the left of the dotted line; what has actually happened so far. Stocks have obviously built up a significant lead during this time. 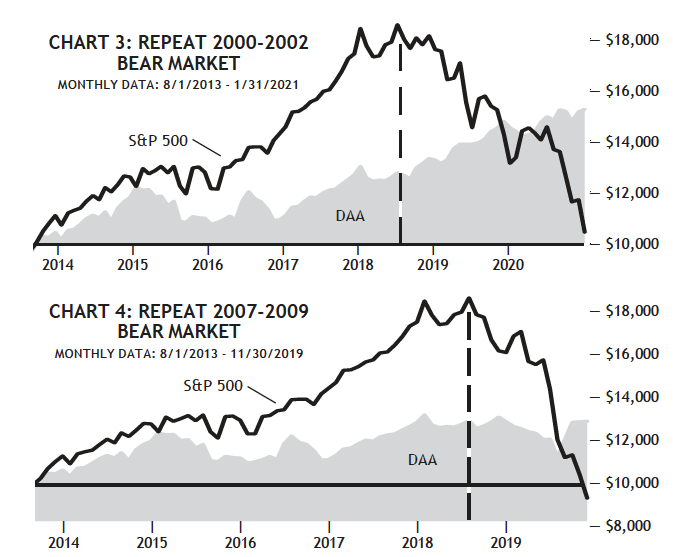 The area to the right of the dotted line shows how “the rest of the story” would turn out if, from here, the stock market were to follow either the path of the 2000-2002 bear market (Chart 3) or the 2007-2009 bear market (Chart 4). In either scenario, DAA would end up comfortably ahead of the stock market for the period as a whole, despite stocks being far ahead at the moment. The main thing we’re trying to demonstrate with this analysis is that nothing has fundamentally changed regarding DAA. It’s still on track to beat the stock market — but that’s only going to happen over full market cycles. Our limited experience with DAA since 2013 has been with the exact part of the market cycle in which DAA looks the worst and is the most emotionally challenging to stick with. Expecting DAA to keep pace during the bull market portion is unrealistic. But as this analysis shows, this pattern of lag-catch up-surpass is built into how the strategy is supposed to work. That it runs counter to the rest of a stock portfolio is a feature, not a bug. Knowing that should make it easier to deal with emotionally through the rest of this market cycle. Every day brings us a day closer to the end of this bull market and the eventual reversal of DAA’s performance relative to the broad stock market. On that score, the future is clearly bright for DAA. We don’t know if we’re right on the “dotted line” marking the peak of the current market, or if multiple months (or even years) of further gains might still lie ahead. But we do know this bull market is already the longest on record. We do know that stock market valuations are already among the highest in history, comparable only to the late-1990s period we’ve repeatedly drawn parallels to. So while we can’t know exactly when the turning point will come, there’s a lot of evidence saying it is likely close. Clearly, we want to follow the DAA line on the charts at that point, not the stock-market line. So regardless of how you’ve felt about DAA over the past few years, it’s difficult to deny that its prospects for the immediate future are bright. SMI often has to wrestle with a tension between what’s ideal and what’s simple enough for members to actually implement. So while we recognize that managing multiple strategies is more work for members, when it comes to DAA, it really needs to be blended in as part of a portfolio rather than the whole portfolio. That’s different than what we’ve said in the past. And it’s not because DAA’s performance won’t ultimately get you where you need to go. It’s just that the emotional ride can be so frustrating that we think it’s the rare individual that could go 100% DAA and be happy. If you’re a set-it-and-forget-it person who never checks the performance of your portfolio relative to the market, DAA would work fine for you, as it really has delivered higher returns than the market with less risk over time. For everyone else, make it a portfolio holding, rather than the whole portfolio. SMI has written many times about a 50/40/10 type portfolio divided between DAA, Upgrading, and Sector Rotation. While the individual components may vary from person to person, we think some sort of blend among strategies is the ideal because it diversifies both the performance and emotional aspects of your portfolio. It’s much easier to be patient with DAA lagging when Upgrading is earning double-digit returns and Sector Rotation has been exploding higher, and vice versa. If you’re a newer reader, it’s perfectly fine to start with either DAA or Upgrading alone and get comfortable with it before adding more to your plate. But we’d encourage diversifying further eventually. When DAA was introduced, it was the only defensive tool in our lineup. Now that we’ve added defensive protocols to Stock Upgrading, that’s no longer the case. Naturally, this has caused some SMI members to wonder if DAA is still necessary, or if they could simplify by just using Upgrading. Big picture, we think a blended portfolio with both approaches is better, because no one knows what the future will hold. The diversification benefit of having both strategies navigating via different tools and courses is considerable, in our opinion. But we also understand the complexity issue, so it’s acceptable if someone wants to simplify by boosting Stock Upgrading at the expense of DAA—provided they really understand the tradeoff they are making. As we showed in the January 2018 cover article introducing Upgrading 2.0, its downside protection hasn’t been as strong as DAA’s historically. This has meant better upside for Upgrading during bull markets, but also greater losses than DAA during bear markets. Specifically, while Upgrading 2.0 would have lost -12.1% in the April 2000-September 2002 bear market, DAA would have gained +19.6%. 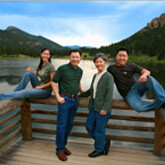 Results were similar between November 2007-February 2009, with Upgrading 2.0 down -17.4% while DAA lost only -1.4%. Both strategies performed dramatically better than the overall market during those bear markets, and both have beat the market over time. They just follow different paths to get there. Are you a good fit to manage DAA yourself? Experience has shown that not everyone is a good emotional match for DAA. That doesn’t mean these folks wouldn’t benefit from having it in their portfolio, but it may mean they’d be better off having their DAA portfolio managed by someone else. Thankfully options exist for this in the form of a mutual fund that follows the DAA strategy, and DAA is also available as part of a professionally-managed Private Client portfolio through SMI Advisory Services. Dynamic Asset Allocation has given us a powerful defensive tool that helps reduce our reliance on bonds. By approaching the markets from a totally different path than the other SMI strategies, it adds a significant diversification benefit to a portfolio otherwise comprised of Stock and Bond Upgrading and Sector Rotation. While its individual performance path can be emotionally challenging, the impact it has on a portfolio as a whole should make it easier for an investor to stick with their plan over the long haul. Avoiding big emotional mistakes is the key to long-term investing success, and DAA can be a valuable ally in accomplishing that goal.